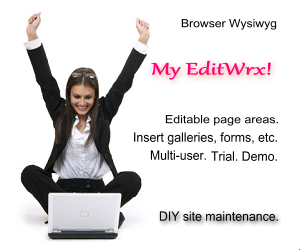 to give a site designer control while allowing clients or co-workers safe editing capabilities with robust features. to give a site owner quick, easy access to content management on their own site without mastering HTML. Give users only the tools you want them to use. Simple to learn Windows application type user interface. Auto-installer to get you up and running with a free trial! Text, images, tables, forms, links, uploads, etc. Installs on Linux/Apache or Windows/IIS servers. Runs in Explorer, Firefox, Chrome and Safari browsers on Windows or Mac. Auto-updates to keep your installation secure and feature rich.